Last week was the annual Geneva Motor Show, and established as the European motoring event of the year. Move over Frankfurt and Paris, now in alternative years, with the rest just sales occasions and not the place for manufacturers to unveil their latest and greatest. Geneva combines the ridiculous (concept cars that will never see the light of day), pre-production prototypes that usually make it next time around, and cars now on sale to the general public. The Jaguar XE epitomises this scheme of things, the public world-wide finally able to buy Coventry’s entry into a market dominated by the Audi 4 series, BMW 3 series, and Mercedes C class, the XE in its development stages tantalisingly at previous shows. Your Editor was many years ago Lotus Cars PR Manager and further on details what he believes could be the best Lotus yet, the Evora 400, of course revealed at Geneva. For generations Bentley and Rolls-Royce were one. Not so now. The former is part of Volkswagen and the latter BMW. Both cars are assembled in the UK. The pair were attention seeking at Geneva. Rolls-Royce is just one year later than the show (established in 1906 v 1905) and, while younger than some others, is still the stately monarch of the motor industry. Its competitors come and go. As for Bentley it had on show a true sports car in the grand style, not a competitor for the latest MX5 (also at the Salon). Aston Martin is another marque of long standing, it could be argued only still alive because of James Bond (suppose he had chosen a Jensen?). Morgan was at Geneva, its order book not as long as it used to be with the Aero 8 receiving significant updates. But you won’t find any by looking at the photos. It is all internal. As a British car McLaren is an upstart, and most people would have forgotten its New Zealand heritage. In fact in a sense it dates back to 1970 and the loss of Bruce McLaren. At the time he was developing the M6GT sports racer and basic road car of which only two were ever built. Starting with the 1992 F1, with its more or less unique three seat layout McLaren has built a series of innovative high performance sports over the 20+ years. The coupé-only 675LT – LT refers to its long-tail aerodynamic design, something first used on the 1997 F1 Longtail – sits above the 650S coupé and Spider in McLaren’s range of so-called ‘Super’ models. It will cost £259,500, or around £64,500 more than the 650S on which it is based. This now brings us back to Lotus, which has had more than its fair share of ups and downs since it was established by Anthony Colin Bruce Chapman in a Hornsey, North London, lock-up in 1952. ACBC unexpectedly died (a non-smoker and hardly drank) in December 1982. Today carrying the Lotus badge is Lotus Cars Ltd, the production car company owned by Malaysian interests, Classic Team Lotus enthusiastically run by Colin’s son Clive, and Lotus F1, a franchise trading on the world famous name and heritage. Unveiled at Geneva is the Evora 400, said to be the make or break for the company. We have heard that before, but this time the development of what is a very good car. (See BTN 15 December www.btnews.co.uk/article/8243) could turn out to be something outstanding. An initial target of 2000 units a year should be comfortably exceeded. Group Lotus Plc is now a wholly-owned subsidiary of DRB-HICOM, with three operating units: Lotus Cars, Lotus Engineering and Lotus Motorsport. Besides the Evora the car division builds the road going Elise and Exige. Lotus Motorsport builds and develops vehicles for GT racing with the Evora GX, GTC, GT4, and GTS, in addition to racing vehicles such as the Exige V6 Cup, Exige Cup R and Elise Cup cars. Lotus says that the Evora 400 is faster and dynamically more capable than the previous model leading to greater agility and a more involving drive. Maximum speed is 186 mph and acceleration 0-60 mph is just 4.1 seconds. This enabled the new car to lap the challenging test track at the Lotus Headquarters in Hethel, Norfolk, a scintillating six seconds than its predecessor. Over two-thirds of the Lotus Evora 400 is original, including its supercharged and charge-cooled mid-mounted 3.5-litre V6 engine producing 400 horsepower and 410 Nm of torque. The immensely strong aluminium module chassis sits beneath a new interior and the lightweight composite body has changed significantly both front and rear. The car is also 22 kg lighter, achieved through careful and clever design and attention to detail. 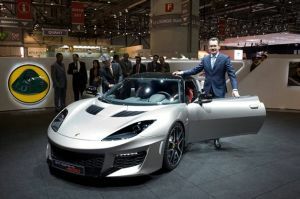 The new Lotus Evora 400 will enter production for European markets in the summer and deliveries start in August this year. North American markets will receive the Evora 400 as a 2016 model year presentation in the Autumn. Combined production for all Lotus models, the Elise, Exige and Evora, will increase to 70 cars per week by September 2015 and an additional 150 highly skilled operators and craftsmen and women will be recruited in the next four months to accommodate this rise in production. The UK price of the new car is expected to start from around £60,000.